Launch your Career Today with our New Masters in Procurement, Law, & Strategy. 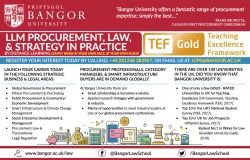 We are delighted to announce the launch of Bangor University’s new Masters (LLM) in Procurement, Law, and Strategy in Practice, an accredited distance learning program that will enable candidates to develop their legal, procurement, and operational management expertise, whilst propelling their careers. The LLM in Procurement, Law, and Strategy in Practice has been designed for candidates who cannot physically move to the UK/Bangor to engage in Postgraduate study. Furthermore, the course will provide a springboard for accelerated career progression in Public Procurement, or into private bodies, all of whom have procurement functions, which need to be serviced. Understand the differences between being a procurement manager and a procurement leader. Great scholarships & bursaries available. Applied research linkages with government & industry. Plenty of opportunities to meet industry leaders at one of our global procurement conferences. One of only a few GOLD - RATED Universities in the UK for Teaching Excellence (UK Government, Teaching Excellence Framework (TEF), 2017). Top 10 in the UK’s National Student Survey (NSS, 2017). Top 10 in the UK for Job Prospects (WhatUni Survey, 2017). Ranked No.1 in Wales for Law (Guardian University Guide, 2018).